Silent films captured Dietrich’s eroticism and aura of mystery. Her role as Lola in “The Blue Angel” made her an international star. Marlene’s version of a glamorous “Femme Fatale” is the reason, she was one of the highest paid actresses of the 1930’s. 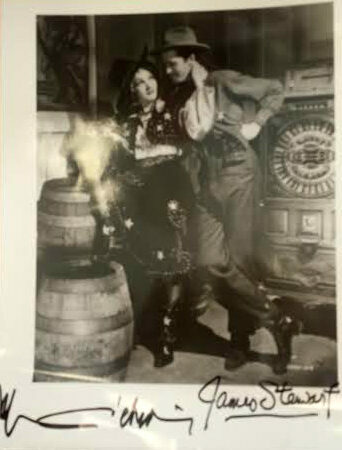 In 1939’s light-hearted western, “Destry Rides Again” she played “Frenchie” the saloon girl. Dietrich offered great chemistry opposite Jimmy Stewart’s drawl voiced peace keeper.This was his first western. The film was a huge success. The next year, would have Stewart winning an Academy Award for “The Philadelphia Story.” Contact My Forever Treasures if you’re interested in this item. Click Here.